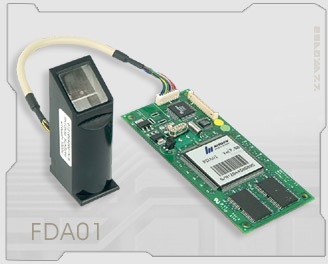 FDA01 (Standalone with built in CPU) is the fingerprint recognition module compromised of optical sensor and processing board. With high speed CPU and accurate performance algorithm, it supports high and faster recognition speed and applicable to various products through simple but robust hardware design technology. In addition, since it contains CPU and memory in the processing board, user enrollment and authentication for fingerprint recognition are available without separate PC. Built in fingerprint authentication function. Storage function for authentication log (8000 logs). FDA01 Developer's kit consists of FDA01, Manuals, CD for technical document, demo controller, all of which are required to develop applications. 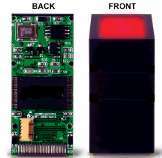 Demo Controller: Controller with keypad and LCD unit. Main controller technical document: Circuit diagram and source code. None of the Standalone modules have specialized 1:N matching algorithms. They have 1:1 algorithms which can be used for 1:N matching for smaller number of users. e.g. most standalone modules will offer 1:N matching speeds of approx. 10 fingerprint per seconds. Q. What is the flash requirement for 720/2000/4000 users ? what is the standard configuration and capacity ? what is the ordering information for this? We are at present normally keeping modules supporting 2000 users though others are also available. in case required. Modules ahve inbuilt flash and ram as per requirements, you are not required to provide any external flash unless you want to store data for your own needs. For ordering jsut specify the no. of users you want in module. Q. What is the cost of development kit ? Q. Did you give anytraining on your products? Yes, available in support package. Q. What is the template size resolution ? Q. Storage function for authentication log (8000 logs), Is this onboard and what is the provision for extra log? Q. Does you are having any standard enclosures for fda 01 for an access control product? Low cost Standalone Fingerprint Module with only 150 fingerprint storage capacity. High speed recognition. Applicable to various product through simple but robust hardware design technology.